If you're a connoisseur of high-style, handcrafted quality and distinctive natural materials, you're going to love Cisco Brothers. Whether you're looking at your new furniture from the inside out, or from the outside it, you're sure to be impressed with the design, the raw materials and the high level of detail that comes with any Cisco Brothers piece. While they are perhaps most famous for their timeless 'California Modern Casual' style, with long, soft pillows and comfortable linen upholstery, you'll also find pieces in their line that are a perfect fit in a more sleek modern home, or in your traditional setting. Whichever style you go for, you'll be comfortable knowing that the inside is built to the utmost. A piece of Cisco Brothers Furniture comes with several options inside, starting with a natural soy-based foam, hand-tied spring systems, and layers of wool and cotton. If you're looking to upgrade, you can choose a pure, natural latex foam, more layers of wool, and on certain models, add the feather comfort cloud. These carefully chosen materials will ensure that your new furniture is not just beautiful, but also a treat to relax on. And you'll know that it will stay that way year after year. 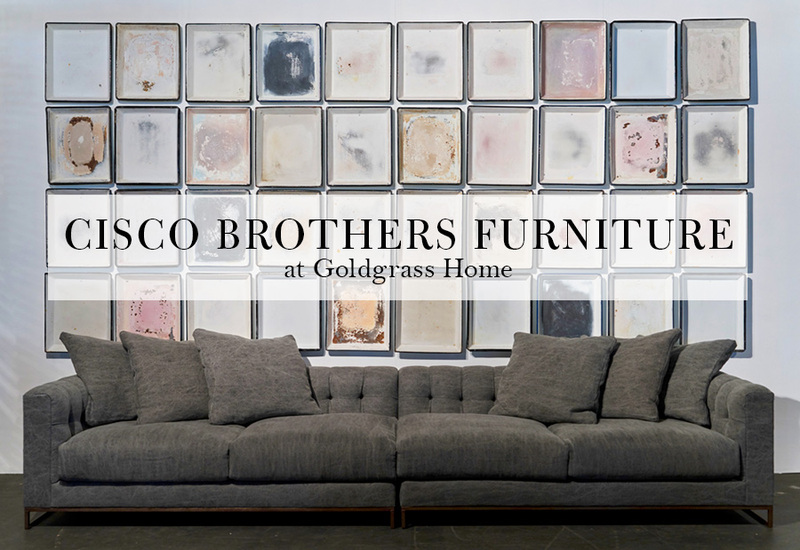 Visit our Goldgrass Home flagship store to feel the Cisco Brothers difference!